The triangles are made from ASTM A36 steel plate. We have these laser cut and powder coated. We countersink the holes to reduce wear on carabiners or other connectors. Top of the Line: $315 includes the Tri-Fly and two CM 3/8-inch black steel shackles one steel carabiner. 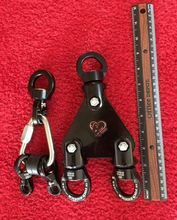 Option for three CM shackles and no carabiner. This rigging configuration is about 12 inches long with three shackles. Straps and Top-of-the-Line Package: $515 for Top-of-the-Line Rigging plus 10 ft straps. Dyeing straps included. Hammock Straps / Giant Loops and Top-of-the-Line Package: $540 for Top-of-the-Line Rigging plus 8 ft loops. Dyeing straps included. Rock Exotica swivel shackels for standard Tri-Flies are back in stock! ​​Custom triangle with 3 Rock Exotica Shackle Swivels and 6 custom-made delrin spacers to create a "tight and snug" product. Shackel Swivels backordered until March. Custom triangle with 2 Rock Exotica Shackle Swivels and third hole to accommodate a carabiner on the top. Top carabiner sold separately. 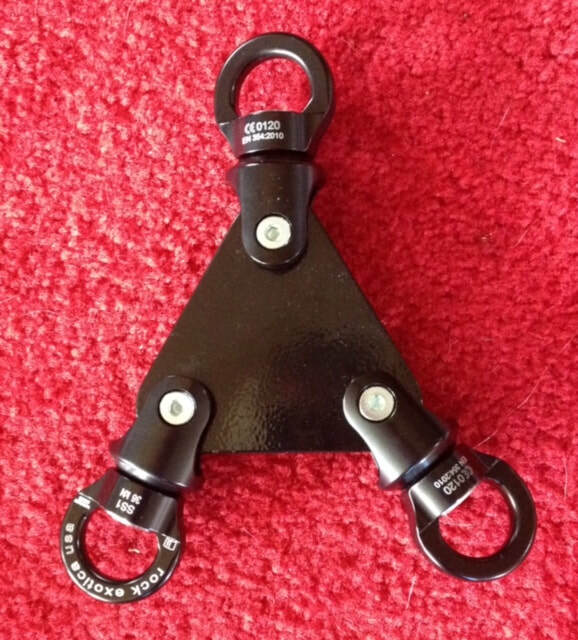 Shackle Swivels backordered until March. ​The main purpose of the original Tri-Fly was to be compact and be aesthetically pleasing or disappear and not distract from performer or photo. It weighs 2 lbs 8 oz. Some people don't like the weight, price or need all black. So we've assembled the "Tri-Fly Lite" which weighs 13 oz. We are using two Rock Exotica Nano swivels, one Rock Exotica Small Rotator Round swivel and one 10 mm Maillon Rapide Delta (PPE) and two custom rubber grommets. "The Tri-Fly is for a straps artist the perfect gear when it comes to functionality. It’s small, the swivels are already incorporated, you just have to add maillons and you're good to go. It's compact, very efficient and looks professional. When it comes to style, if you do a lot of drops (Chinese style) or any kind, the Tri-Fly can take a lot of pressure and doesn't move at all. But if you enjoy doing one arm swings or two arms, you might feel the block moving with you and sometimes act against you if you're not careful or too violent in your swings, simply because it's a whole block at the top of two straps. If you're like me and you love spinning the Tri-Fly does an amazing job, the space between the swivels is perfect for them to not hit each other and the efficiency of the swivels is very good." "This is by far my favorite gear ever made by Patti. The gear is simple, pretty, very light, it feels like your bag is actually empty. The Rock Exotica Nano Swivels allow an incredible spin and fit feels like there is no friction at all while spinning between the heads of the Nanos. Guarantee of amazing spins! When it comes to drops, I would not drop on Nanos simply because they are smaller and I don't feel as safe as in the Tri-Fly. The space between the Nanos compared to the Tri-Fly is much smaller but so much worth the speed!! I would recommend the Tri-Fly -Light to all people that like myself, love spinning and to create new sequences on straps. One arm dislocs and beats feel really great on it also!"